The iStick QC 200w is Eleaf's newest edition to the family. 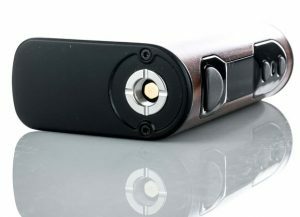 It's a sleek mod with a four-button interface and is packed with tons of power. It follows up the power with a ton of useful features that make a serious contender for your daily vape. This mod is for everyone who has 25mm or smaller tanks and does not have a disdain for internal battery mods. If you absolutely hate mods that don't have removable batteries, then don't even consider this one. Just save yourself the frustration. One last thing that may mean this mod isn't for you. It's 25mm wide. If your favorite tanks are wider than 26mm then they'll hang off the edge of this mod. A 26mm tank fits pretty well on it, but any larger will definitely hang over. Not many tanks are wider than 26mm but there are few so it's worth mentioning. I don't like it when my tanks hang off the edge but 26mm is wide enough for me. The iStick QC 200w is simple enough that someone new to mods can use it and has enough power to vape the best tanks on the market. I rarely vape at 200W so this has more than enough power for me. You might be in the same boat as me which would make 200W plenty of power for you. There are vapers out there who vape beyond 200w regularly. If that's you, then you might feel limited by this iStick. To summarize, if you vape beyond 200W regularly, use really wide tanks, or hate internal batteries this mod isn't for you. For everyone else, keep reading to see what this mod brings to the table. Click Here to get the best deal on the new Eleaf iStick QC 200w mod! Here's a quick look at the highlights of the iStick QC 200w mod. The iStick QC 200W is full of features features that are not only innovative, but actually useful. I see a lot of these companies coming out with innovative features but they're not always practical. I call them novelty features. One of the things that's annoying in the vaping space is all of the acronyms used. It seems like companies just make them up at will. This mod made me think about acronyms because some people might not know what QC means. QC is a pretty common acronym, but it's all the other ones that cause a lot of confusion in the industry. I still, to this day, am not sure if RBA means rebuildable base atomizer or rebuildable atomizer lol. Let's start with braking down the name of this mod just in case some people aren't sure about vaping shorthand. The QC in the name stands for quick charging. The 5,000mAh internal battery charges at 1.5A which is pretty fast. It's not the fastest speed available on the market, but it's above average. The Wismec Predator 228 has a 2A USB charging port which is ultra fast. But 1.5A is still pretty darn fast which is awesome to see on a mod that has an internal battery. For mods with removable batteries, I almost always use an external charger so rapid charging is not as big of a benefit for me there. Of course, the 200W stands for 200 watts which is the max output of this mod. It can go as low as 1W but you'll probably never take it that low. This rendition of the iStick provides more than enough power for your average vaper. The iStick QC 200W boasts an astounding 5,000mAh internal battery. The battery pack consists of three batteries in a series configuration. If a company is going to go with an internal battery, they should go big or go home. That's exactly what Eleaf did with their newest iStick. An internal battery mod that dies halfway though the day is no fun at all. This mod will last you all day as long as you're not pounding your tank around 200 watts the whole time. Since you can't charge the three batteries in the battery pack separately, Eleaf has included cell balancing technology. Essentially, this technology makes sure that the cells charge at the same rate. They also included reverse charging (RC) technology. Unfortunately, it doesn't come with the reverse charging adapter. If you're not sure what reverse charging is, I'll explain it briefly (it's simple). Reverse charging is a technology that allows you to convert your mod into a power bank. 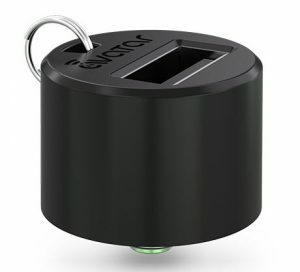 You'll be able to use it to charge your cell phone, tablet, or any device that can be charged via USB. The downside is that you can't vape on your mod while it's charging another device because the RC adapter uses the 510 connection. So basically, if you want to use this mod as a power bank you'll have to buy the RC adapter separately. The iStick's smart mode is pretty simple but really useful. It remembers up to 10 different atomizers by their resistance and saves your setting. I love this feature because it saves me a lot of time. I like to find the sweet spot for my atomizer/mod/juice combo and vape it there until I switch juices. Even after switching juices, sometimes I keep it at the same wattage. Certain atomizers just vape better at a particular wattage, even with different juices. To be able to switch to 10 different atomizers and have the settings just how you like it is awesome. The two-line OLED screen is capable of displaying all kinds of information. Of course, it can display the output wattage/temperature, voltage, mode, battery life, and resistance. That's pretty standard but it can't display all of those things at once. The screen is on the smaller side. That's a downer if you're looking for a mod with a big OLED screen. You can choose from several different display interfaces, which each display different information. One of them is the puff counter display interface which is becoming increasingly popular. The iStick QC 200w also has upgradeable firmware which is always nice to have. I love having upgradeable firmware because I can buy the mod with peace of mind. I know if there's any kinks that made it past production that they'll be ironed out with an upgrade. When spending my hard earned money it makes me feel that much better that a company creates an avenue to make sure my mod is running flawlessly. Safety features that you would expect in a regulated mod are integrated into this mod as well. Features such as over charge, over current, over discharge, reverse polarity and temperature protection are all present in the iStick QC 200w. The mod by itself only costs $49.95. All things considered, that's a good price point given all the features and maximum output. 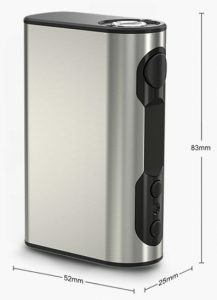 You also can get it bundled with the Melo 300 (Eleaf's massive cloud chucking tank) for $69.99. You'll save $10 if you buy the bundle. The bundle is perfect for anyone looking to put out some serious cloudage. Overall, the Eleaf iStick QC 200W is a great mod that is positioned right in the sweet spot. It has a great wattage range without going bonkers like some of the newer mods and it's feature rich. This would make for a great mod for you if you like high capacity internal battery mods.